FEEF’s 29th Annual Mayor’s Tourney to Benefit Fairhope Schools Fairhope, Ala.— Take a stand for public education and register now for FEEF’s 29thAnnual Mayor’s Golf Tournament. The tourney, organized by Fairhope Educational Enrichment Foundation and The City of Fairhope, is scheduled for Thursday, March 23, 2017 at Quail Creek Golf Course. Proceeds provide Fairhope students with innovative and creative programs including science labs, engineering, art, music, and theatre. With title sponsor Terry Thompson Chevrolet and chaired by Jake Defee, the tournament returns this year with a full day format allowing space for both corporate and individual teams. Preferred morning and afternoon tee times are available on a first-come, first-serve basis. Sponsorship includes Wednesday’s practice round ($17 cart fee only), Thursday’s round, complimentary breakfast, lunch, beverages on the course, dinner, and the chance to win door prizes generously donated by local businesses. The tournament format is a four-person scramble with a morning shotgun start beginning at 8 a.m. and afternoon shotgun start at 1 p.m. Winners in the low net and low gross categories will receive prizes. Hole-in-one prizes, including cars and cash, will be awarded to anyone making a hole-in-one on designated par 3s. Prizes will also be awarded for closest to the pin on each par 3, the longest drive, and the putting contest. Non-golfers can participate by adopting a tee sign, honoring a teacher, coach or classroom, for $150. Twenty-five dollars from each tee sign sold goes to the honoree for use in the classroom. 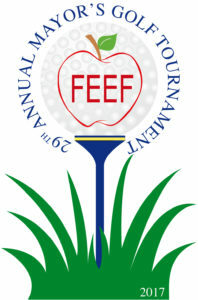 FEEF will display the tee sign at one of 18 tee boxes during the tournament and again outside the schools during the week following the tournament. Year-round advertising on Quail Creek tee markers is also available. Pending space available, the registration deadline is Friday, March 17, 2017. For more information, call 990-FEEF or email info@feefonline.org.